Following September flooding of Tekoa Country Club in Westfield, Mass. courtesy of Tropical Storm Irene, the superintendent/head golf professional E.J. Altobello asked me to make a visit to the course and give my thoughts on his fifth hole. 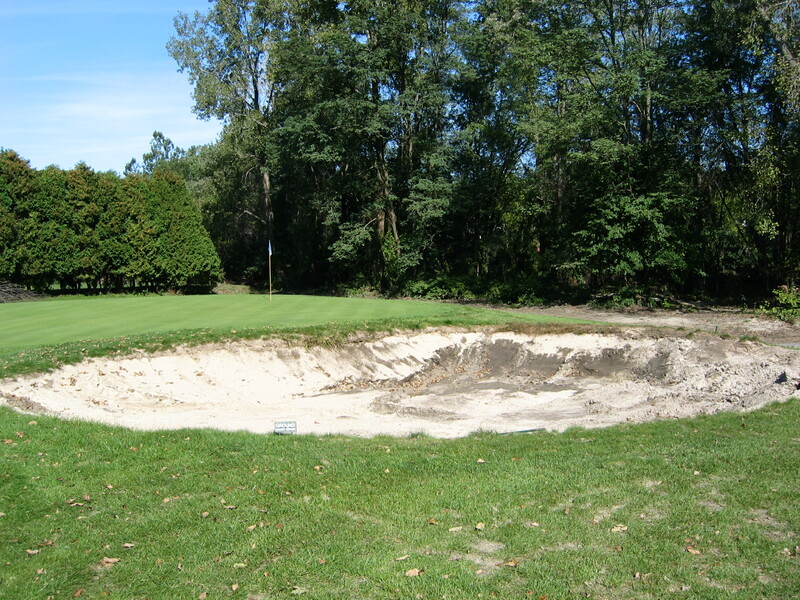 The Westfield River gouged out the greenside bunker on the fifth necessitating a rebuild and since the hole also had tree issues, E.J. thought it a good opportunity to make improvements. A Google Earth image of Tekoa's fifth hole in 2010. After spending a day looking over the hole, I sent him a one-page explanation of my suggested alterations along with an accompanying drawing. My goal was to create a more playable hole for the average golfer while adding challenge for the better golfer. 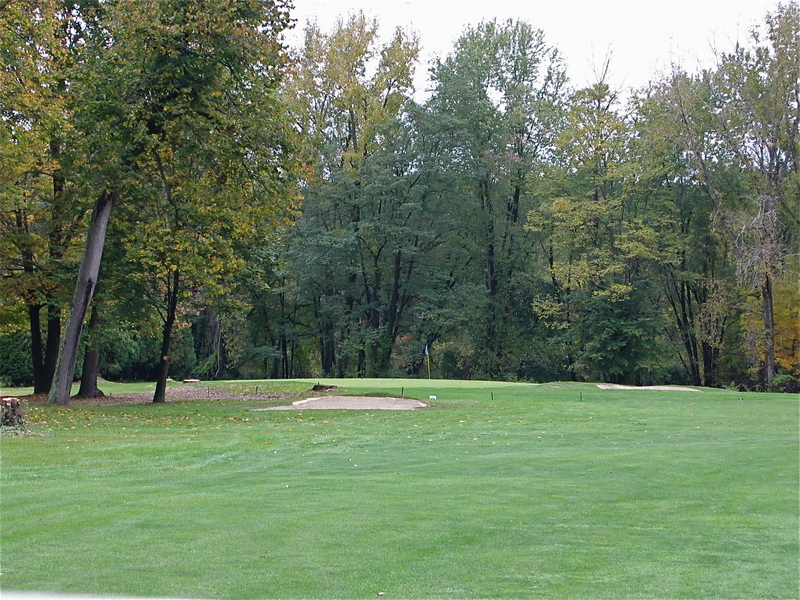 Tekoa, an affordable daily fee layout, was originally a 9-hole Donald Ross course that opened in 1923. The club has an original Ross drawing of the layout. Holes 1-3 and 9 were on the north side of Route 20 while holes 4-8 were on the south. In the 1960s, through eminent domain, the State of Massachusetts took the club’s land on the south side of Rte. 20 in order to build Westfield State College. 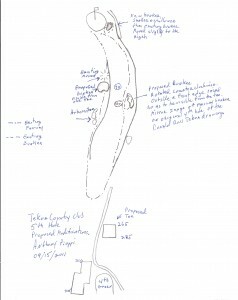 In return, Tekoa was given enough land to the north to create an 18-hole layout incorporating the surviving five Ross holes. 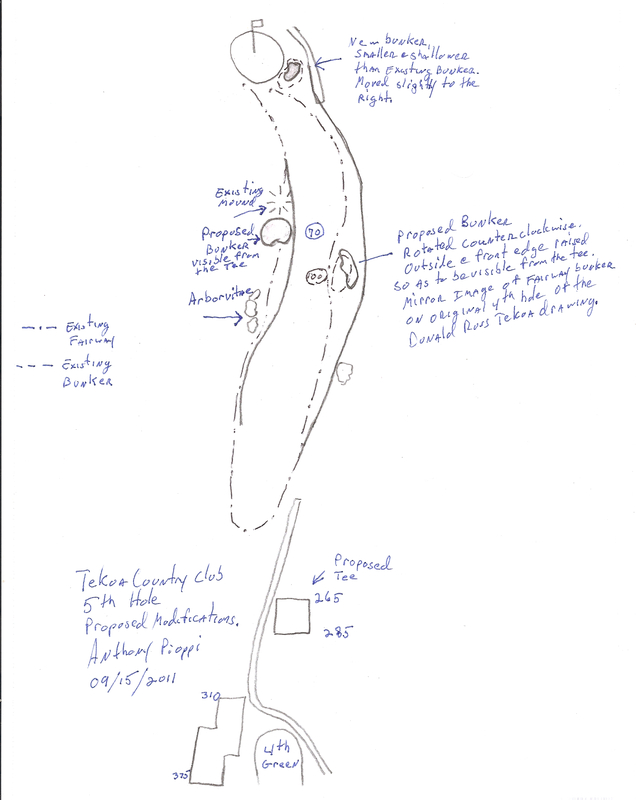 According to architect Geoffrey Cornish, he was hired by the then owner of Tekoa to design a new course but was never paid for the plans and the layout was built without his input. My drawing showing the proposed changes. On the current layout holes 2-4, 14 and 15 are from the Ross course and have the most strategy and most interesting greens. Many of the par-4s and par-5s are straight and reward long drives that find the fairway without giving the player a preferred side to which to play off the tee. On the holes that bend, playing away from the inside of the turn rarely results in any sort of penalty for taking the timid route. The fact remains, however, that with some tweaking on many of the holes—bunker work here, tree removal there—Tekoa could be made into a much more challenging and fun layout. Take for instance the fifth hole, on which I worked, which is not a Ross design. It is a dogleg left of 315 to 375 yards. When I set about making modifications, the hole had one fairway bunker that sits parallel to the line of play on the right side about 240-260 yards out depending on which tee is being utilized. From the white tee it is well out of the reach of the average Tekoa player. The only other bunker on the hole prior to the work was the one to the right of the green. The putting surface sits at fairway level but beyond it there is a slope that drops off sharply. An overzealous approach can carom down the incline and end up deep into the lateral hazard short of the river. 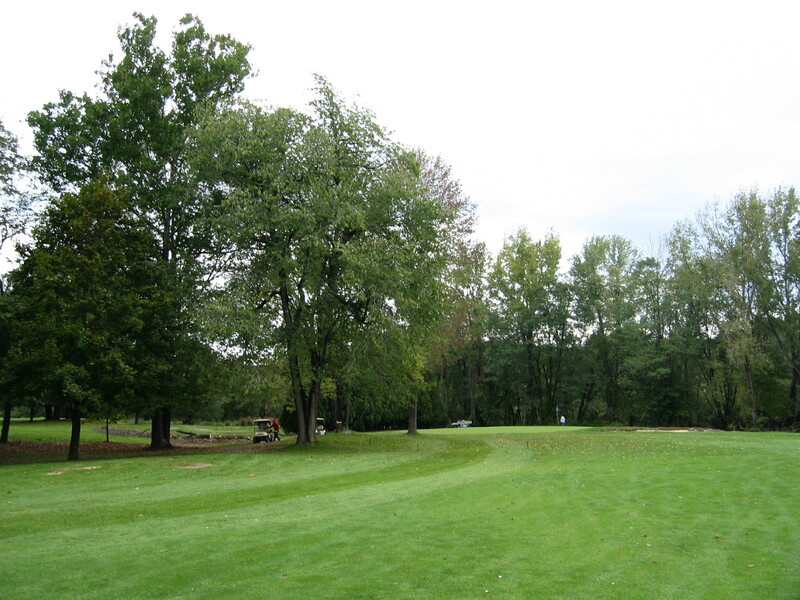 Over the years, trees grew in on the left of the fairway and green and arborvitae were planted in the left rough. The putting surface suffered from shade issues and encroaching roots. Tree limbs so encroached on play that anyone who found even the left side of the fairway with a tee shot was forced to hit a severe bender around the trees in order to reach the green. 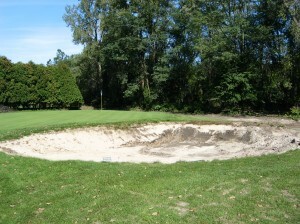 The greenside bunker after the flood. Hitting a tee ball into the left rough resulted in an overly severe penalty for such a slight miscue. The only logical second shot was a punch-out into the fairway. No fun at all. The longer hitters avoided the left side by bombing the ball down the right, perfectly content to play in from the rough rather than from under a tree. For them, prior to our alterations, there was no reason to try and work the ball to the inside of the turn even though the green opens to that side. My plan called for the removal of nine trees and the arborvitae. E.J. and I agreed we should reduce the circumference of the greenside bunker as well as reduce the depth from over four feet to less than three feet. I also had the idea for the addition of a fairway bunker on the inside of the turn at 275 yards from the back tees. Along with that, I suggested rotating the right fairway bunker so that it would angle into the fairway. I also called for raising the back edge so that the bunker is easily visible from the tee. The existing fairway bunker is little more than a hole in the ground and can barely be seen from the tee. Due to a small maintenance budget, other than the tree cutting, all the work on the fifth hole was done in-house by the Tekoa maintenance staff, including, E.J., and me. As part of the modifications to the greenside bunker we decided to shape the fairway and rough so that the ground falls into hazard in an effort to snare shots that are just right of the target and direct them into the sand. Tekoa’s Kirk Tewksbury manned the backhoe and did a fine job contouring the new bunker and surrounds. 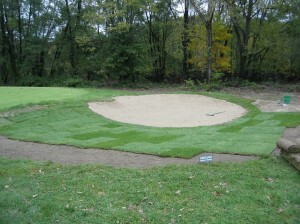 The fairway hazard bunker was all handwork since tractor and operator were needed for a fairway fertilizer application. The fifth hole before alterations. Ryan Fanion, a recent graduate of the University of Rhode Island turf program, Andrew Killips, one of the seasonal employees, and I dug the bunker using the soil we removed to form the front edge berm. The fifth hole after the first round of modifications. 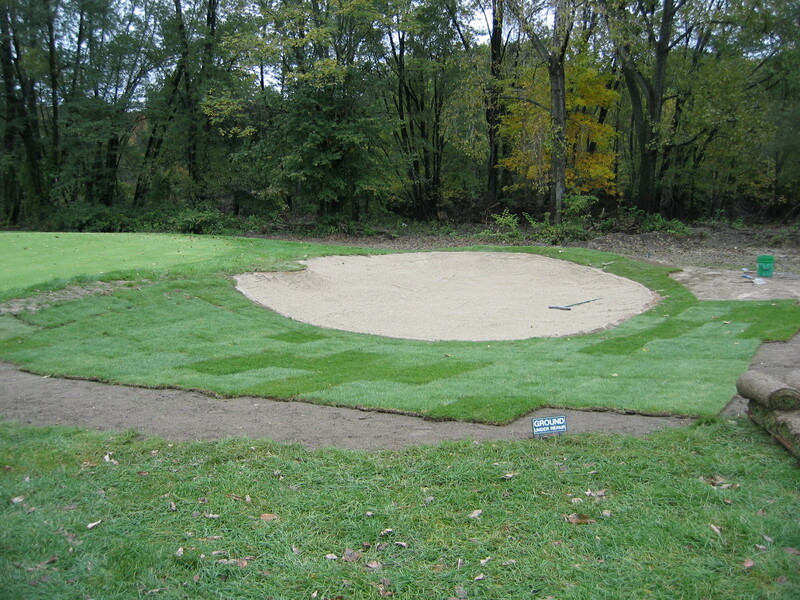 The new fairway bunker, which I placed into a natural depression, has two roles. First, it breaks up the left side sightline from the tee. Second, it is in play for the longer hitter looking to take the ball on the inside of the dogleg, the preferred route. Feedback from the Tekoa regulars on the changes to the fifth hole has been extremely favorable. If the weather goes our way we’ll be redoing the right fairway bunker this year, as well. TOPICS: Golf, Mass. Golf Assoc.